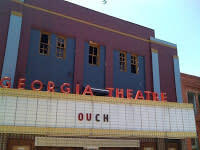 In last Sunday&apos;s LA Times, The Georgia Theatre fire and rehabilitation efforts were covered in a Hometown U.S.A. feature. The article, (click here to view) profiles owner Wilmot Greene as he begins to rebuild the music venue that once played host to R.E.M. and the B-52&apos;s.
Among the things mentioned in the article, what I found most compelling was the reporter&apos;s comment that donations and fundraising ideas poured in even before Greene had time to set up the necessary legal apparatus to accept them. Athens is always noted for its&apos; music scene, parties, and football. But beyond that it serves as host to citizens (and students) who truly care about the history and preservation of their home (or home away from home). It is nice to see that sense of concern was noticed by the LA Times reporter.